We are very excited to be announcing the release of Viira 3.0! The latest version contains a lot of productivity enhancements that many of you have requested and we are very happy to be bringing all these new capabilities right at your fingertips. In-Basket: Designed specifically for the collection phase of Getting Things Done, Viira’s In-Basket provides a convenient place to quickly enter a number of tasks, ideas and reminders. All tasks, native tasks, email and SMS tasks that have not been assigned a project, context or day will appear in the In-Basket. Search. Quickly find the task that you were looking from Viira’s Tasks View with Viira’s fast search. Reminders. Many of you have asked for the ability to add a reminder to a particular task, and we are happy to bring this feature to you! Although David Allen warns against relying too heavily on reminders in your GTD system, if used properly they can be a powerful ogranizational tool. BlackBerry Tasks integration: Viira loads all tasks from your BlackBerry’s native Tasks application in the In-Basket from where you can further assign then to a project, context or day. Hide Completed. Hide all completed tasks and focus on what remains to get done. Hide completed is available from all of Viira’s views and all your completed tasks will appear once again when you select “Show Completed”. Quick new project/context creation: Have you ever started entering a task only to realise that the project or context you want to classify it under has not been created yet? With Viira 3 you can quickly create a new project or context right from the new task editor without having to switch views! And more! Viira 3.0 contains a number of other smaller enhancements, too numerous to list here. So grab the free trial and see for yourself what Viira 3.0 can do! You can download the Viira 3.0 free trial from the Viira download page or by pointing your BlackBerry’s browser to our mobile site www.kartamobile.com/bb. For all of you using Viira 2, Viira 3 was designed to run alongside Viira 2 so that you can check out the free trial before committing to the new version. Viira 3 will also import your Viira 2 data. Buyers of Viira 2 are also eligible to upgrade for a special upgrade price of only $19.99. Viira 3 is compatible with all modern BlackBerry devices all the way back to OS 4.6. In this week’s update we have added 24 hour time formatting to Viira capabilities. Appointments, both when edited and when displayed in Viira’s Day View will display in 24hr time format for all of you using Viira in countries that traditionally use 24 hour time format (or all of you who have set your device to 24hr mode). For example instead of appearing as “2:00pm-3:00pm” your appointments will now show as “14:00-15:00″. The 24hr time formatting kicks in automatically when Viira detects that your device is set to display times in 24hr format. Otherwise the familiar 12 hour time format is used as before. As always, this update is a free upgrade to all buyers of the full version and can be downloaded OTA by pointing you BlackBerry to our BlackBerry site www.kartamobile.com/bb. Are you trying to download Viira OTA and seeing a “500 Internal Server Error” right after you click the link to install Viira? Turns out this cryptic error is caused by a security setting on the BES server that manages your BlackBerry device. In effect this setting ends up preventing 3rd party apps like Viira or the Viira Outlook Suite BlackBerry client to be installed over-the-air directly from our site. Install via BlackBerry Desktop Software. Both Viira and the Viira Outlook Suite provide a ZIPed installer which you can download and easily install by using the BlackBerry Desktop Software that comes with your device. Just click on the Download tab above for a list of download options. Add kartamobile.com to your TLS. Under Options->Security Options->Advanced Security Options->TLS, add kartamobile.com and www.kartamobile.com to the list of trusted hosts. Then go to our mobile site www.kartamobile.com/bb from your BlackBerry and perform the download again. Use an alternative BlackBerry browser to download and install. On OS 5.0 and earlier BlackBerry devices like the Bold 9700 for instance, you have a choice of different browser configurations that you can use. Open your browser, select Options->General Properties and then select a different option under Default Browser. A good option would be “<Your carrier name> browser” or the Hotspot browser. Click save, close your browser then open it again and attempt to download OTA again. We are happy to announce that Viira Outlook Suite 1.1 is now available for download. Version 1.1 contains significant productivity enhancements such as email tasks, enhanced UI on both the Outlook plugin and the BlackBerry client as well as touchscreen support for all of you Torch and Storm owners. We also added a few convenience and time-saving features like the quick add button that lets you quickly add a task from anywhere in Outlook as well as a quick launch button. Organize your email. File your email messages into you GTD system from both Outlook and your BlackBerry. 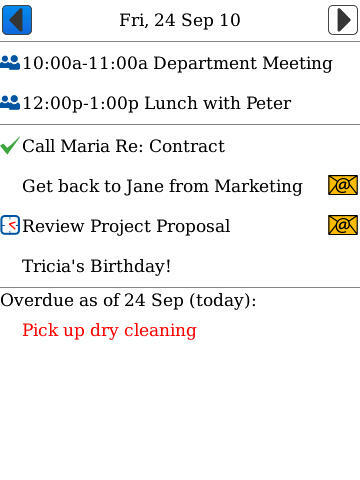 Email tasks created from the Viira Outlook Suite Outlook plugin can be then viewed from the BlackBerry client, and vice versa. Fast startup. 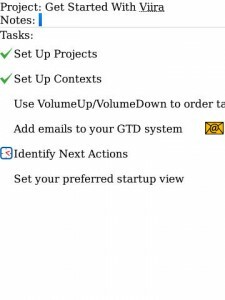 The startup time of both the Outlook plugin and the BlackBerry client have been dramatically increased to give you an even faster access to your portable GTD system. Enhanced UI. 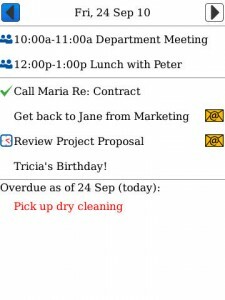 The Viira Outlook Suite BlackBerry client now sports the UI from Viira 2.2, enabling an intuitive transition between the main views. Touchscreen support. Owners of a BlackBerry Torch or Storm can navigate using the touchscreen on their device. Search. Quickly locate the tasks you are looking for from the Viira Outlook Suite Outlook plugin Tasks view. Quick launch. Lauch the Viira Outlook Suite Outlook plugin quickly from anywhere in Outlook by clicking on the new launch button on the Outlook toolbar. Quick add. Add a new Viira Outlook Suite task from anywhere in Outlook! A new quick add button is now available in your Outlook’s toolbar enabling you to jot down ideas and to-dos quickly and with ease. The Viira Outlook Suite comes with a free trial. As always, the 1.1 update is a complimentary upgrade to all buyers of the 1.0 version. This article describes what to do in order to make sure your Viira data is transitioned successfully when you upgrade the device software (OS) on your BlackBerry. Many of you are “taking the plunge” and upgrading the OS on your BlackBerry devices. While there are many benefits from doing this, the steps below will ensure that your Viira data follows you along on your freshly-upgraded BlackBerry. It is important to keep in mind that upgrading the OS on your BlackBerry starts with erasing all data from your device . A new OS version is essentially a fresh start, and the new OS versions require a clean blank slate to start from. This is why it is critical to perform a full device backup before upgrading your OS. Otherwise, your old data may simply be lost forever. 1. Backup Your Viira Data. The BlackBerry Desktop Software performs a quick, one-click back up of all your device data which will automaticlly back up your Viira data in the process as well. More information can be found from our Backup/Restore How-To Article. Note that data backup/restore is only avaialable on the full version of Viira. 2. Perform the OS upgrade. We won’t provide much details here. You know what you are doing here. 3. Re-install Viira. After your OS upgrade is complete you will need to install Viira on your newly-upgraded device. The backup file contains only application data and not the applications themselves, so performing a data restore will not re-install Viira. Restoring your Viira data (step 4) requires that Viira is properly installed on your device, otherwise the restore will not take effect. You can download the latest version of Viira by pointing your BlackBerry to our mobile site www.kartamobile.com/bb, or by visiting the downloads section on our site. 4. Restore your Viira data. At this point your can either perform a full restore all of of your pre-upgrade device’s data, or select only to restore Viira’s data. It really depends on what makes most sense in your case. You can select to to restore only Viira’s data by using the advanced backup/restore tips we describe in our Backup/Restore How-To. With your BlackBerry plugged in to your computer via USB, open the backup file you created in step 2, clicking “Select device data and settings” then click on “Viira 2″. Pressing Restore will restore your Viira data to your BlackBerry. Outlook 2010 support is now available in the Viira Outlook Suite! As promised earlier to many of you upgrading to MS Outlook 2010 or about to upgrade in the coming months, you can now take full advantage of the only fully-synchronized BlackBerry-Outlook GTD organization system using the latest version of MS Outlook. 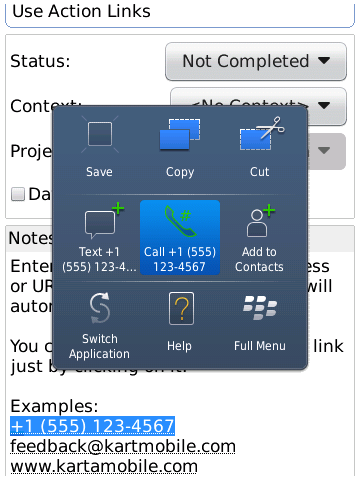 You can download the latest version 1.0.5 of the Viira Outlook Suite Outlook plugin from the Viira Outlook Suite downlod page and install the Outloook Suite BlackBerry client OTA by pointing your BlackBerry to our mobile site www.kartamobile.com/bb/outlook. While we are still actively working on the Viira Outlook Suite 1.1 and you will be seeing the results within a matter of weeks, we wanted to make MS Outlook 2010 support available as soon as we completed the work on it. Those of you that have Outlook 2010 can continue to apply the principles of Getting Thigns Done day-to-day with your BlackBerry and Outlook! We always strive to find new ways to help you stay on top of your schedule, make the most of your BlackBerry and have the most comprehensive, portable GTD system at your fingertips. With that in mind, we are excited to bring another powerful feature to help you get things done - action links. Action links allow you to easily embed actionable chunks of information, such as phone numbers, email addresses and website links inside any task in Viira. Simply enter the phone number, email or URL in a task and Viira will automatically detect it and highlight it for you. Calling, sending an email or viewing the website link is then just a click away! Action links are available in Viira 2.2.2, which can be downloaded OTA from our mobile site www.kartamobile.com/bb. A month and half after the release of version 1.0 of the Viira Outlook Suite, we are very glad to hear that many of you are using its unique capabilities to stay on top of your commitments and get things done. As this is the first step in what will be a long journey of bringing you the most powerful Getting Things Done-based personal organization system for Outlook and BlackBerry, we wanted to share with you what we are working on and give you a glimpse of what will be coming out next. Outlook 2010 support. With teams and organization around the world slowly but surely migrating to the latest version of MS Office, Outlook 2010 integration is at the very top of our to-do list. Outlook 2010 support will be available in the Viira Outlook Suite 1.1, and all buyers of version 1.0 will receive it as a complimentary upgrade. Email integration. Incorporating your email in your Getting Things Done organization system is a must-have for many of you who receive dozens, sometimes hundreds of emails a day. We are actively working on email integration and will be rolling it out in the Viira Outlook Suite 1.1. Faster startup. Speed of access to your GTD-based organizational system is a critical aspect that we never loose sight of. We constantly strive to make things faster and more efficient and will be rolling out performance enhancements starting with the upcoming Viira Outlook Suite version 1.1. Our internal benchmarks show our enhanced designs having drastic improvements for both the Outlook Suite plugin and the BlackBerry client - so stay tuned! The Viira Outlook Suite plugin - accessible from anywhere. We know that many of you power users of Outlook regularly switch between the multiple view in Outlook - Tasks, Email, Contacts, etc. We are actively working on integrating the Viira Outlook Suite plugin with different areas inside MS Outlook in order to provide you with quick, one-click access to you trusted GTD system and all your Viira Outlook Suite data. We are all very excited for the upcoming 1.1 release, so stay tuned! If you haven`t already done so, you can sign up for updates and be among the first ones to know when the 1.1 is available for download. As we always do with any of our software products, the 1.1 release comes as a complimentary upgrade to all buyers of version 1.0. We recently received our much anticipated BlackBerry Torch 9800 through our partnership with RIM, and got fast at work at making Viira available on the Torch. Viira 2.1.2 is also compatible with the newly-released BlackBerry Curve 9300, also known as the BlackBerry Curve 3G. While we normally don’t comment on new devices and the excitement surrounding them, our entire dev team has been absolutely wowed by the Torch 9800. Everyone feels like it is an incredible additional to the BlackBerry roster, nothing short of a game-changer. What makes it so remarkable? In addition to much of the OS 6 goodness, we found the ability to type with precision with the pull-out QWERTY while at the same time reaching in and “working” the touchscreen makes doing almost anything incredibly fast. To all of you migrating to a BlackBerry Torch or just joining the BlackBerry world with it, congratulations on a great acquisition. The Torch looks like an incredible platform for getting things done! Viira Outlook Suite 1.0: The First BlackBerry-Outlook GTD Solution Is Here! he Viira Outlook Suite version 1.0 has been released. We are very proud to be the first to bring you an integrated BlacKBerry-Outlook GTD solution, and hope that it will help you stay on top of your commitments and get things done in your day-to-day lives. Inbox. All unassigned tasks (i.e. tasks without a project, context or date) appear in your Inbox. A must-have capability for the collection phase of GTD®! Outlook Tasks Integration: Your Outlook tasks appear in your Viira Outlook Suite Inbox, ready to be assigned to a project, context or day. Switch from using Outlook for GTD with ease! BlackBerry Tasks Integration. Your native BlackBerry tasks appear in the Inbox of your Viira Outlook Suite BlackBerry client. Viira 2 Data Import. Buyers of Viira 2 can easily transition their BlackBerry GTD system to the Viira Outlook Suite. Just go to Settings->Import Viira 2 Data (activation required). The Viira Outlook Suite comes with a 14-day free trial. As with Viira, buyers of the full version of the Viira Outlook Suite will receive point upgrades for free. For example, buyers of the Viira Outlook Suite 1.0 will receive the 1.1, 1.2, 1.3, etc. as free upgrades. For more information on how to install, set up and make the most out of the Viira Outlook Suite Outlook plugin and BlackBerry client that comes with it, please visit the Viira Outlook Suite page. Beta Members, Buyers Of Viira 2 Receive Almost 50% off! To show our appreciation to everyone who took part in our beta program and helped us ensure that the Viira Outlook Suite works and works well in a wide range of environments, we are extending a one-time offer of $30 off the regular price! As promised before, buyers of Viira 2 interested in migrating to an integrated BlackBerry-0utlook GTD system get the full purchase price of Viira 2 as a purchase credit towards the Viira Outlook Suite (updated amount will appear in the Paypal checkout page).